I received a ton of nice comments from Rob, John, Scott, and Phil related to my previous post, What Software Bloggers Do Girls Like Better? Phil even did a nice follow up post, with some good humor gloating, until the end where his wife let the air out of his sails; like only a wife can do. The day I posted the article, Scott instant messaged me to say good job on the article. 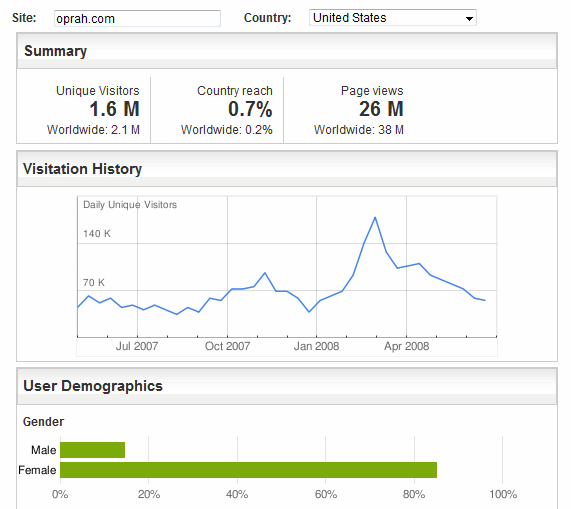 During the conversation he mentioned that I should compare the stats to Oprah.com as a base point for the other statistics. So naturally I thought this would be a good follow up article. The results of this, non scientific, study was very disturbing. 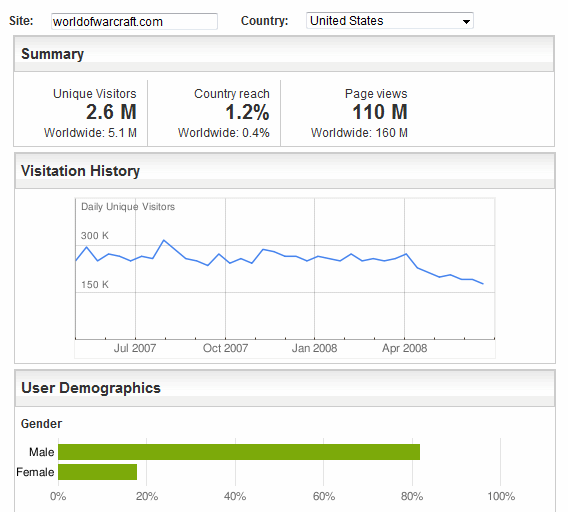 Mostly because about 3 out of 25 people who visit WoW on the internet is a female, which blows me away because I was expecting something like 1/50. This means means the World of War craft beat out Jeff, Joel, and Scott, and Phil is slightly above the WoW site at about a 5% lead. The numbers for Oprah was about what I expected, and probably align very closely to her TV numbers with about 85% of her viewers being female. If anybody has a better website, than World of Warcraft, for me to compare these guys against please let me know.